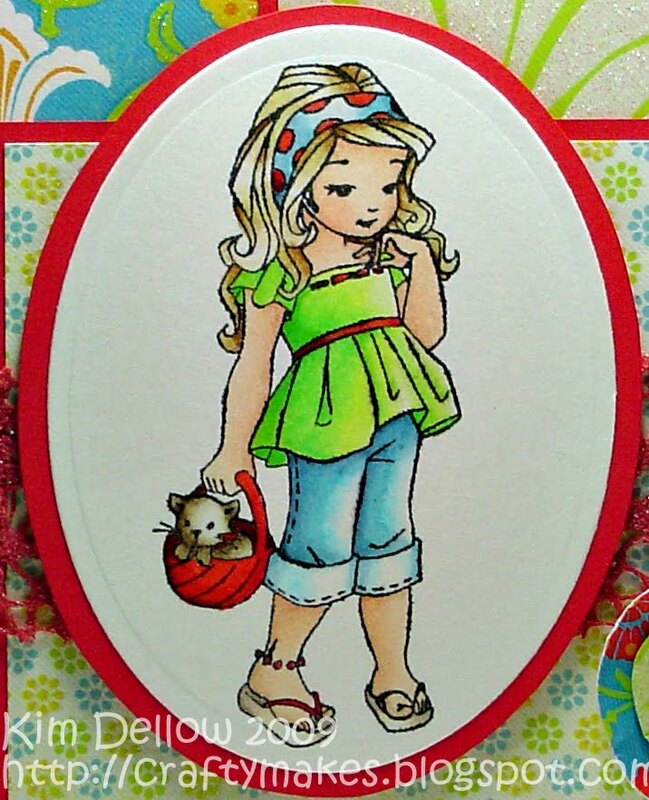 Here is a sunny card with the totally gorgeous Emma from the Elisabeth Bell range for Susan’s Custom Art and Card Design (SCACD), which if you are wondering how to get your hands on, well they are at Quixotic Paperie as well as the totally cute Victoria Case Stamps from SCACD. I’ve used the lovely DCWV Citrus stack papers which are on very special offer at Quixotic Paperie 50% OFF! OMG how can you miss that? Tee-hee! BTW – there are lots of other fabulous specials on Quixotic Paperie as well. Also I’ve used a lovely bit of Crochet ribbon that I’ve painted with Shimmerz Paints Fire Engine Red. And yep – a bit more Copic practice! The sun has just this second come out here – Wahoo:) Must be the sunny card, LOL! Next postOooo Look At These! Your card is gorgeous Kim, just love the papers and the image. Hopefully it will now make the sun appear over here ! Waiting to take a photo, it was better at 9 last night ! Are you still saving those pennies ?!! Wow, a beautiful, bright and cheerful card – just what I needed to see on a dull day like today. Love those flowers too! such a sweet image and I love the gorgeous bright colours, beautiful and cheerful! Love your handmade flowers and the buttons you have used! gorgeous!! Gorgeous, Kim! Loving the bright colours. And I love that you painted the crochet ribbon! Gorgeous card Kim, love those pretty, sunny papers….. just what we need on a day like this! This is gorgeous.I love bright citrus colors. Love your handmade flowers. Gorgeous! Love the red lace! Wow Kim that is such a beautifully bright and cheery card – love those papers and you definitely don't need any more practice with those copics – you've certainly cracked them. OMG this is absolutely darling. Kim your colors are sooooo beautiful, wow and your coloring is GORGEOUS!!!! What a beautiful card this is!!! Totally gorgeous Kim! Love the bright sunny colours and your copic colouring is fab!! Oh this is delightfully beautiful. Such happy colours. Wow, I love your card. That is such a sweet image and those papers and colors are great. That would brighten up anybody's day. Wow Kim such a bright happy and sunny card, sooo cheerful. Beautiful zesty colours and your image is coloured beautifully. Wow Kim love these colours very zingy off to take a look Gorgeous card..love it. Super! Love the bright colors Kim! You are getting really good using the Copics. I saw that with complete admiration. I have a ton of them, but can't seem to make anything look good LOL This card is adorable!! 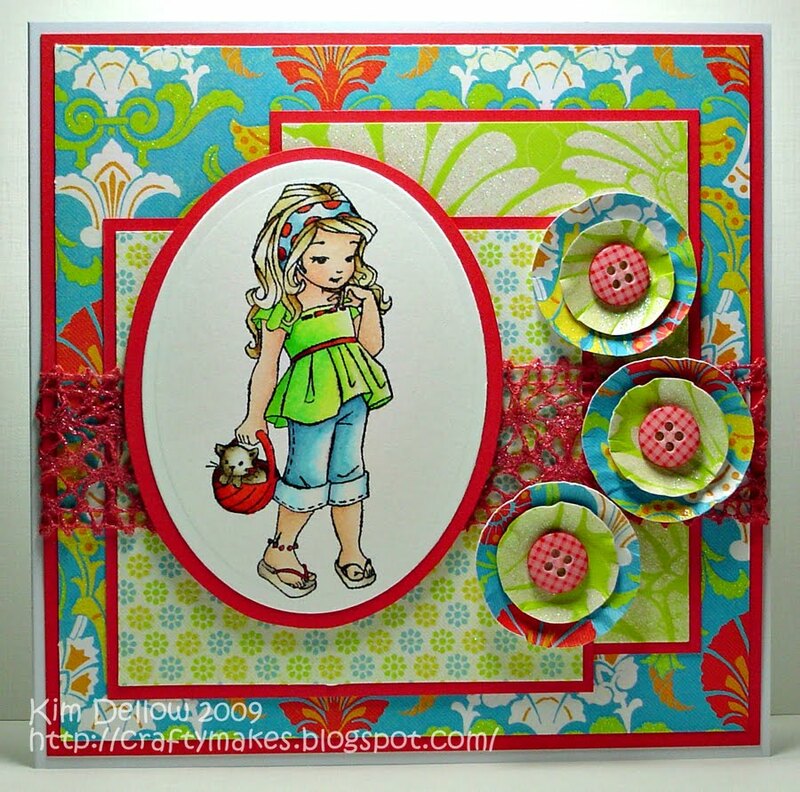 I love the bright and fun colors on this card Kim!!! This is beautiful Kim. vibrant colours and beautifully coloured! Lovely fresh zingy card. great colouring. Kim this is beautiful.. I love the bright colors you chose.. Really looks terrific.. I am thinking we all need a little brightness.. Thanks for sharing..
Oh this is gorgeous, love the vibrant colours and adorable image. Love it. It's really sunny and bright. What a beautiful card, so colourful! The image is very lovely.